January in Germany is a cold, unforgiving time of year. The sun rarely shines, the temperature isn't just chilly - it's the sort of freezing cold that gets into your bones and turns the matter brittle, and popular tourist sights shut their doors for the season. On principle, I try to stay indoors as much as possible throughout the month. I tell myself it's my chance to catch up on household projects I've abandoned, but in truth it's because I don't want to deal with the weather. 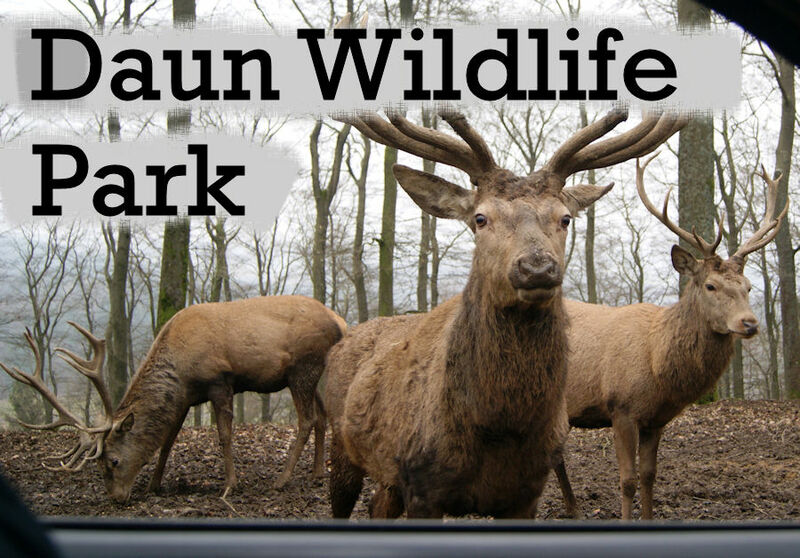 However, the kids can't stand being holed up in the house all weekend and the weather networks promised sunshine (SIDE NOTE: THEY LIED) so Alex found information about the Daun Wildlife Park and thought it would be the perfect day trip to do with the kids. Only half an hour away, the park was conveniently close. I never mind traveling an hour or two to a hot spot, but sometimes it's nice not to have to spend your entire morning and subsequently your afternoon in the car. Entrance into the park costs 9.50 Euro for Adults and 8 Euro for kids 4-12 years old. When we arrived at the park, Alex parked the car and went inside the front building to pay; they gave him a ticket with a bar code on it that we scanned at the gate which allowed us access inside. The wildlife park is different from the other local organizations in that it is ran safari-style. We drove our vehicle around an 8 km path with stopping points along that way that we were allowed to park and walk around. There were coin operated feed machines at each station as well as covered viewing platforms with benches and tables. Alex had bought a box of feed when he got our tickets, and it only cost him 1 Euro. The animals in the habitats weren't extraordinary or unique to that park - a lot of deer, llamas, donkeys, and goats; however, this was by far the most hands on experience around. At the first stop no less than six donkeys were swarming the cars as they parked in the designated spots. Poor Landon almost got squished between two as he was fixing his hat! I turned my eye from him for a second and hear, "Ahh!" Look back and he's in a donkey sandwich, his little head buried between two smelly, furry bodies. I had a moment of panic...he loved it. He said it was his favorite part of the day! Evie, who is our massive animal lover, was over the moon. She thoroughly enjoyed looking out her window and seeing any number of woodland creature nosing up to the car; I don't think there was a single stop where she wasn't all smiles and laughter. In total, there were 6 viewing stations but we only got out at 4 of them. One was for warthogs but they were so prevalent around the car that rather than get surrounded the second we got out, we simply watched them from the warmth of our car. The second station we skipped was set up on the top of a steep hill, and Alex and I were too lazy to carry the kids up all the steps. A picture of one of the viewing platforms. The tour is roughly the shape of a gigantic circle with the entrance and exit converging at the bottom of the loop. Also located there (so visitors can stop at either the beginning or end of their traveling journey) are bird houses and a monkey inhabitant. There were only five or six birds in their habitats when we went to look, but we still considered it a success since Evie adored the owls. She begged us to return to them before we left! Not to mention, the view was a perfect example of Germany's beautiful scenery. Outside the monkey exhibit are lockers to store bags and food, because none of that is allowed inside. The fenced-in enclosure is deceptively large. Alex and I were not expecting to walk as much as we did. Although, we were very relieved we saved the monkeys for the end, because it gave the kids a chance to stretch their legs after hopping in and out of the car for an hour. I won't lie, being mere inches from a baby monkey while they chow down on some old bread really sets the bar high for future monkey encounters. I don't think zoo visits will be quite the same since standing so close to one without any kind of barrier between the two of us. If you're a fan of monkeys, THIS is the place to go. You can't get much closer to one than at Daun Wildlife Park. No German center would be complete without a wonderful children's playground near the exit. There were a few structures that were closed for the season, such as a slide and trampoline, but the regular centers were accessible. The playgrounds were right next to a gift shop and restaurant (both closed) a petting zoo with more llamas. In addition to the farm animals, there was a meerkat enclosure, chicken coops, and bird houses. Each individual sight came together to make a thoroughly enjoyable area. A kids' haven, if you will. Had it been warmer and the restaurant been open, I could have stayed there with the kids for hours, letting them feed the animals and play on one of the three playgrounds. In total, we spent over two and a half hours at Daun. Much longer than we expected to, actually. The weather was abysmal, but the kids had a blast. 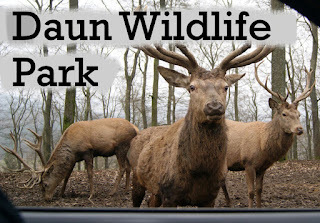 This place was definitely made for the younger crowd; I would say any kid in the 10 and Under age range would love visiting this wildlife park. While it's not someplace I could see us returning to over and over again, we'll definitely be sure to return one more time when it's warmer to let the kids use the playgrounds more than they got to this time. For a January outing, it was a win in our books! This looks like an incredible excursion. Thanks for sharing your visit!